NEW YORK — Jimmy Mirikitani, an artist who went from living on the streets of New York City to starring in the acclaimed documentary “Cats of Mirikitani,” has died at the age of 92. Jimmy Mirikitani during his final pilgrimage to Tule Lake last July. “It is with deep, deep sorrow that we must share the sad news that our dear friend Jimmy Mirikitani passed away on Sunday, Oct. 21 … Thank you for all the love you have shown him; his friends and fans meant the world to him,” the filmmakers said on the “Cats of Mirikitani” Facebook page. They announced that a memorial program, open to the public, will be held on Sunday, Dec. 9, at 5 p.m. at the Japanese American Association, 15 W. 44th Street, 11th floor, New York, NY 10036. 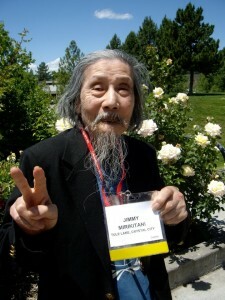 Jimmy Tsutomu Mirikitani was born in Sacramento in June 1920 and raised in Hiroshima. 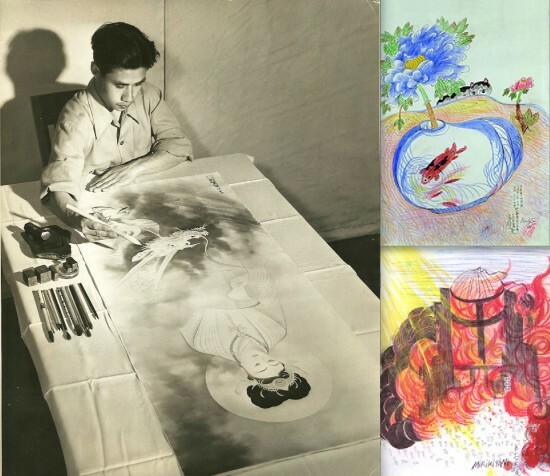 At the age of 18, he returned to the U.S. to pursue a career in art and escape the growing militarism in Japan. He was living with his sister Kazuko and her family in Seattle when the Japanese attacked Pearl Harbor in 1941. Executive Order 9066 forced Mirikitani and his sister to leave their home and move to separate internment camps hundreds of miles apart. Kazuko was sent to the Minidoka camp in Idaho while Jimmy was sent to Tule Lake, just south of the Oregon-California border. When the government required internees to take a loyalty test, Tule Lake became a segregation center where those deemed “disloyal” were congregated. Thousands there renounced their U.S. citizenship to protest the violation of their constitutional rights. Mirikitani was one of these renunciants. After the war ended, he and hundreds of others continued to be held without charge, first in Tule Lake, then in a Department of Justice camp in Crystal City, Texas. A single lawyer, Wayne Collins, worked for decades to help Mirikitani and 5,000 other renunciants reclaim the citizenship they had given up under duress. In 1946, Mirikitani was transferred to Seabrook Farms, a frozen food manufacturing plant near Bridgeton, N.J. He and other renunciants on “relaxed internment” worked the 12-hour night shift, six days a week, sorting vegetables on an assembly line. Collins won their release by August 1947, but fully restoring their citizenship took another decade. 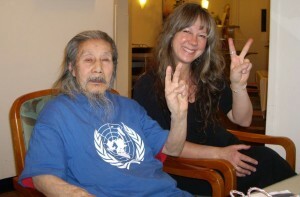 Jimmy Mirikitani with filmmaker Linda Hattendorf. Mirikitani arrived in New York City in the early 1950s to attempt to resume his art career. When an art professor found him sleeping in Columbia University’s library, he was referred to New York Buddhist Church, where he was provided with room, board and training as a cook. For years he traveled the East Coast doing seasonal work in resorts, summer camps and country clubs. While cooking at a restaurant on Long Island, he met Jackson Pollock. Mirikitani’s U.S. citizenship was finally restored in 1959, but by then he had moved so often that the government’s letter never reached him. Eventually, he became a live-in cook on Park Avenue. But when his employer died in the late 1980s, he was suddenly without a home or a job. Within a year, he was living in Washington Square Park in Greenwich Village, selling his artwork to survive. In 2001, he met filmmaker Linda Hattendorf, who was impressed by his artwork. When the toxic air from the 9/11 attack made it unsafe for Mirikitani to live outdoors, she put him up and helped him apply for Social Security and housing benefits. In 2002, he moved into an assisted-living retirement center run by Village Care of New York. Later that year, he was reunited with his sister for the first time in 60 years. The documentary, which Hattendorf co-produced with Masa Yoshikawa and co-edited with Keiko Deguchi, records Mirikitani’s first visit to Tule Lake since the war, during the Tule Lake Pilgrimage, which gave him the opportunity to meet fellow internees as well as younger Japanese Americans learning about their parents’ and grandparents’ experiences. In the course of making the film, he was reunited with his sister for the first time in 60 years and met a famous relative, former San Francisco Poet Laureate Janice Mirikitani. He traveled with the film and displayed his artwork across the country, including venues in Santa Fe and Seattle earlier this year. He made his final pilgrimage to Tule Lake last July. Mirikitani’s art reflects his long and eventful life, as well as the world around him. Images of Tule Lake, Japanese landscapes, and playful cats pepper his drawings and paintings, revealing the artist’s sensibilities regarding humor, loss and love of life. His paintings echo not only a diversity of places, but also a rich and often tragic history that is both personal and social. Jimmy, you will be so missed. It was a pleasure to know you, to play taiko for you, to see your paintings…the last time I saw you was at the Brooklyn Botanic Gardens to see the cherry blossoms. Rest in peace. I’ve just viewed the documentary ‘cats of Mirikitani’ and I found it very moving indeed, from the first minute of the doc I was enthralled by Jimmy Mirikitani his story was a fascinating one made all the more enjoyable with it’s heart warming moment when he found out that his sister was still alive, a truly marvelous piece of filmaking. Another slice of history America would choose to forget…!!!! Jimmy, Linda, family and felines! Truly, such a privilege, such an honour, thank you for sharing this intimate journey so candidly and all those sacred moments, so absolutely breathtaking. The world is a richer place for having known Mirikitani. May you always rest in the peace you espoused. It was an honor to know you, Jimmy. Rest in peace. You taught me a lot about integrity and honor and most of all art. Your drawing also graced my website, and I thank you for that. We both shared the hope that we could make peace with the effects of World War II, and I hope one day that will happen. It must be at least 8 or 9 years ago that I met you and Jimmy. I don’t know how I came to be invited to a small showing of his work, but you and others were searching for ways to raise money. I bought a copy of his marvelous book and tried to have it published in English. An old friend is a very successful agent/publisher who represented Judy Blum (Bloom). Sad to say, I was unable to locate him. However, I’ve made a connection with an agent, but before I go any further I want to know what you think. For all I know, his book may have already been translated and published. If so, I’ll buy more for my grandchildren.